Any time there is trouble, it is because Lady McKenzie reacted inappropriately. 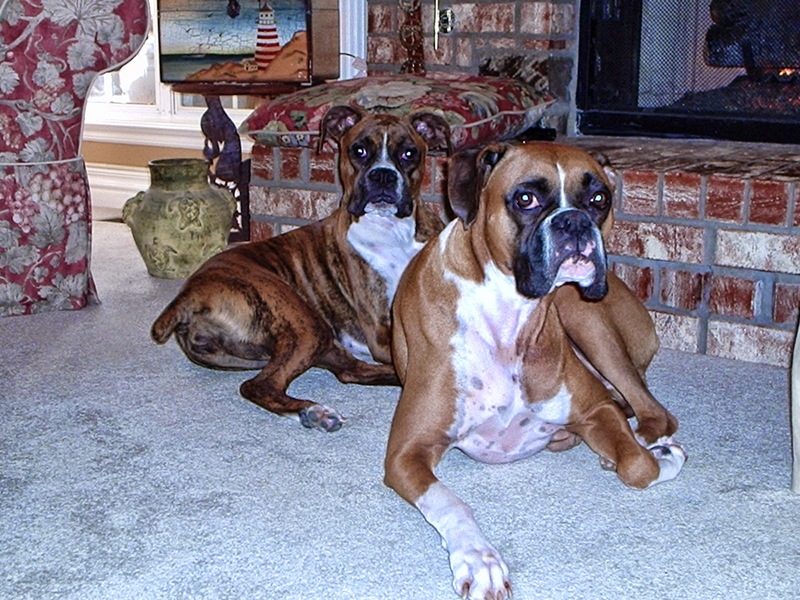 I live with 3 Boxers who are generally the best dogs in the world. I know you don't get that, because I am usually telling stories about their mis-adventures. On a normal day, we get up, eat, play and snooze without issues. All the dogs get along very nicely together. Nessie is quite a lot older, so she doesn't put up with overly enthusiastic advances in play, but she hangs in there and many times, she is the one to initiate the play. Trouble begins when McKenzie reacts. And she reacts to a lot of different stuff. Not the common stuff that you would expect, like thunderstorms and lightening, or even the recent earthquakes we've experienced. No. She leaves that reacting to Nessie. (Which is why the Thundershirt is shared between the two.) And, Nessie is very easy to calm. Put on the Thundershirt and open the kennel door so she can get in, .......then she's totally fine. Sometimes, I'm at my wit's end. I have tried the squirt bottle, which stopped being a deterrent long ago. It is now a treat. They see it coming out and they run over to me and sit so that I will squirt them. They try to catch the water. That would be fine, because they've stopped barking, except when I'm done squirting, they run right back to the barking again, presumably so that I will get the squirt bottle out again and start over. Exact same thing with the command "NO BARK" and treating for stopping the noise. They stop barking and sit long enough to get a cookie and run right back to it again. (And no, I don't treat every time). This time, looking back at me to see if I'll say "NO BARK" again so they can get another cookie. on her when we go on trips in our MotorCoach. It actually really helps her a lot. But not enough to keep her out of my lap. Also, I don't know when the barking will start at home and I don't usually want to run and get it and put it on her all the time like that. What I need is a CALMER HOUSE. Joshua became acutely aware that many of the same human auditory cues affect canines, as well. In test after test, dogs showed a preference for the slowest and simplest classical music. ]**taken directly from Victoria Stilwell Positively "Calming" CD. ** So, I decided to try 3 of the CD's. We recently had to go on a short trip to a smallish town in our State so I put the Thundershirt on McKenzie and got ready. As we were about to leave, the CD's arrived. Not wanting to waste a minute, I grabbed the Bose CD player and off we went. Typically, she climbed into my lap. She was pretty calm with the Thundershirt on, but I wanted to reinforce the feeling. I started the 'Calming' CD. It was beautiful and pretty soon, I was hearing sighs and yawns and deep breaths from all 3 dogs. (It is not recommended that you listen to the CD when driving; however, the bus is huge and there was always Sirius Sattelite Radio for my husband to tune into while driving). I have to tell you, we hit some pretty bumpy and narrow roads with the wind whipping us about quite a bit. Wee McKenzie was never phased. She did look up and around a few times but that was always followed by a sigh and her body relaxing. I made sure to give her good massages as we went to encourage the relaxation. It was truly quite remarkable. When we got home, I put the music on at some point again, and got total relaxation from all dogs. People walked by, school buses came and went, the mailman,......nothing phased them. All was calm. Ahh. Silence is golden. I have not tried the CD for Thunder or Fireworks yet, but I will. In these, she incorporates -- very slowly-- the sound of Thunder or Fireworks into the CD. It starts just music at first, then you begin to hear the sound off in the distance. It gets louder and closer as the CD plays, but the music is continuous. She has specific instructions on how to use these with your dogs. I'm looking forward to trying them. I have a great feeling I'm going to love them too. In the meantime, I've found some of Joshua and Lisa's CD's on Amazon along with his book, if your interested. To order Victoria's CD's, go to her website. Remember, hers incorporate the sounds of either Thunder, Fireworks or City Sounds along with the music. Joshua's CD's are for Calming alone.